Six cars were derailed in the two trains, one of which originated in Beijing and the other in Hangzhou, state media reported. The collision is the first major incident in China's massive high-speed rail network, set to reach 10,000 miles by 2020. The newest line in that network, a Beijing-Shanghai corridor, has been beset by electrical glitches in recent weeks because of poor weather, officials said. The safety of the national network was also called into question when the head of the railway ministry was removed in February because of a corruption scandal believed to have led to shoddy construction. The ministry has since decreased top speeds on the system as a precautionary measure. 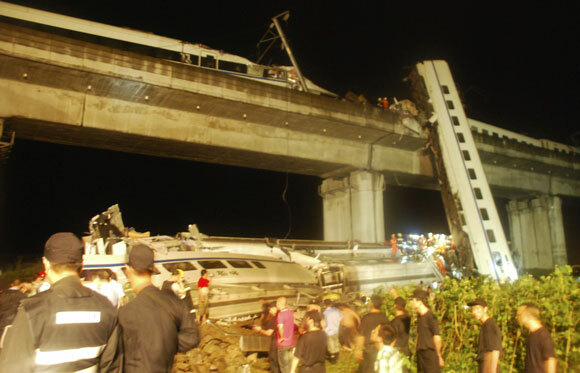 It was unclear how fast the trains in Wenzhou were traveling before they crashed. Known as dongche, the trains were part of China's first generation of high-speed rail. Top speeds reach 155 mph. By comparison, the speed on the Beijing-Shanghai line is 186 mph.